Then, from this understanding, Murshid drew a lesson in sympathy for the troubles and despair of our fellow humans; a lesson for healing. "For whoever really experiences this joy of life, finds that it becomes so great that it fills his heart and his soul. It does not matter if he has fewer comforts or an inferior position than many in this world, because the light of his kindness of his sympathy, of the love that is growing, the virtue that is springing up in his heart, all fill the soul with light. There is nothing now that he lacks in life, for he has become the king of it. Let us take a moment to reflect on what note(s) we (as instruments and receivers) are tuned to. 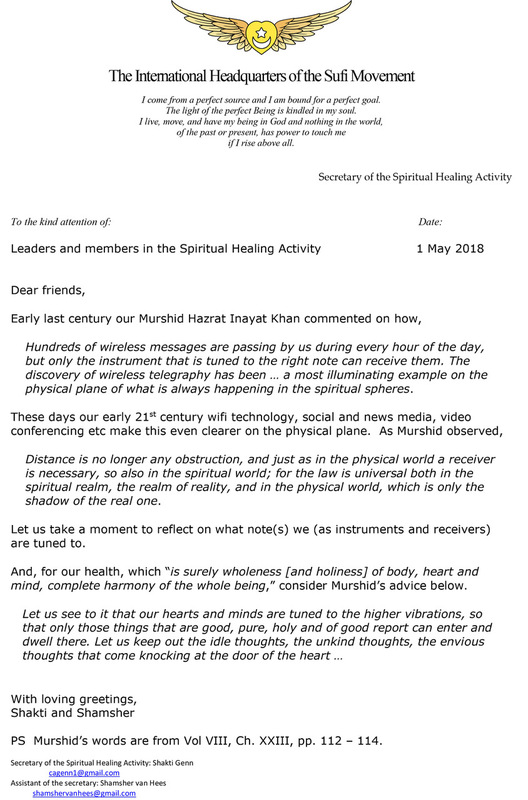 And, for our health, which “is surely wholeness [and holiness] of body, heart and mind, complete harmony of the whole being,” consider Murshid’s advice below. 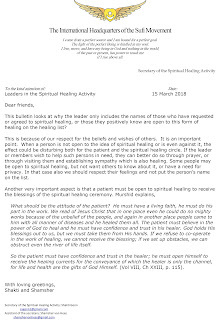 In this bulletin we look at why the spiritual healing leader only includes the names of those who have requested or agreed to spiritual healing, or those they positively know are open to this form of healing on the healing list. This is because of our respect for the beliefs and wishes of others. It is an important point. 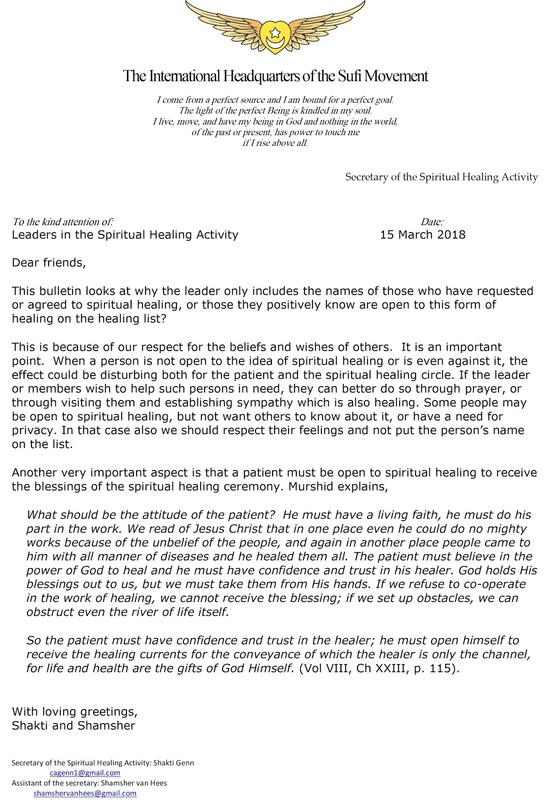 When a person is not open to the idea of spiritual healing or is even against it, the effect could be disturbing both for the patient and the spiritual healing circle. If the leader or members wish to help such persons in need, they can better do so through prayer, or through visiting them and establishing sympathy which is also healing. Some people may be open to spiritual healing, but not want others to know about it, or have a need for privacy. In that case also we should respect their feelings and not put the person’s name on the list. What should be the attitude of the patient? He must have a living faith, he must do his part in the work. We read of Jesus Christ that in one place even he could do no mighty works because of the unbelief of the people, and again in another place people came to him with all manner of diseases and he healed them all. The patient must believe in the power of God to heal and he must have confidence and trust in his healer. God holds His blessings out to us, but we must take them from His hands. If we refuse to co-operate in the work of healing, we cannot receive the blessing; if we set up obstacles, we can obstruct even the river of life itself. So the patient must have confidence and trust in the healer; he must open himself to receive the healing currents for the conveyance of which the healer is only the channel, for life and health are the gifts of God Himself. Let us reflect today on the third prayer in the Spiritual Healing ceremony. Oh Thou, who art all-powerful and all-pervading, the light of all souls, the life of all beings, the healer of all hearts, forgive us our shortcomings, and we pray, free us from all pain and suffering. Make us worthy to be Thy instruments, so that in turn we may free others from pain and suffering, and that we may reflect upon all of humanity Thy light, Thy life, Thy joy and Thy peace. Read or say this prayer several times out loud, slowly. Focus on how we address God as all-powerful and all-pervading, the light of all souls, the life of all beings, the healer of all hearts. Take a moment to notice what you experience when you attune to and acknowledge God in this way. Now read or say the prayer again and focus this time on our aspiration to reflect upon all of humanity Thy light, Thy life, Thy joy and Thy peace. Take a moment to notice what you experience as you attune to reflecting the light, life, joy and peace of the all-powerful and all-pervading. 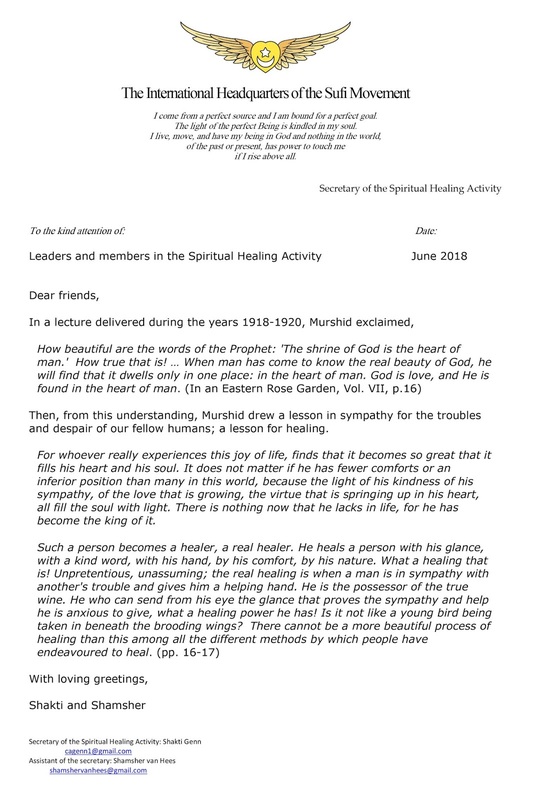 Then, read Murshid’s teachings below about harmonizing with God and the secret of healing. The innermost being of man is the real being of God… All meditation and contemplation are taught with this purpose: to harmonize one’s innermost being with God so that He is seeing, hearing, thinking through us, and our being is a ray of His light. The secret of healing is to rise by the power of belief above the limitations of this world of variety, that one may touch by the power of intelligence the oneness of the whole Being. It is there that one becomes charged with the almighty power, and it is by the power of that attainment that one is able to help oneself and others in their pain and suffering. Verily, spirit has all the power there is. 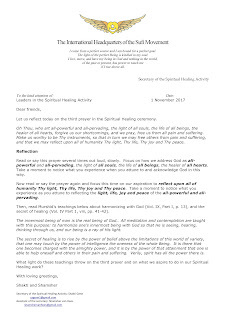 What light do these teachings throw on the third prayer and on what we aspire to do in our Spiritual Healing work? 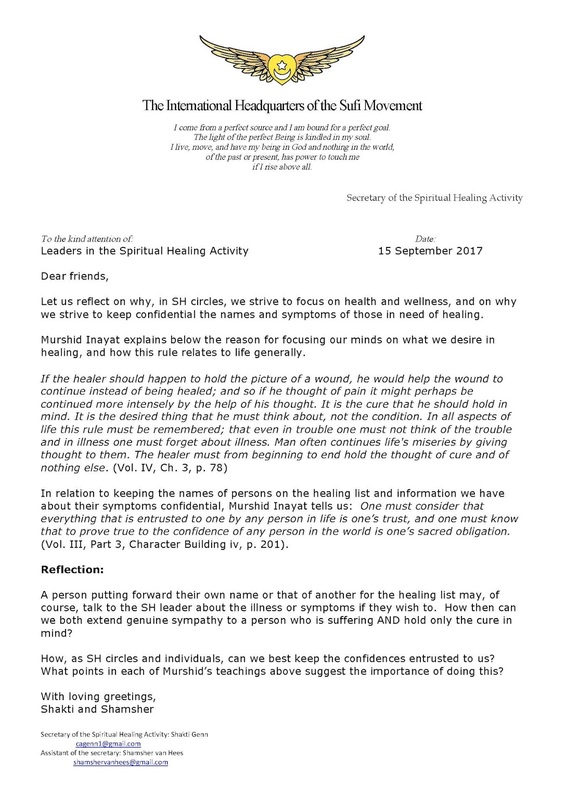 Let us reflect on why, in spiritual healing circles, we strive to focus on health and wellness, and on why we strive to keep confidential the names and symptoms of those in need of healing. 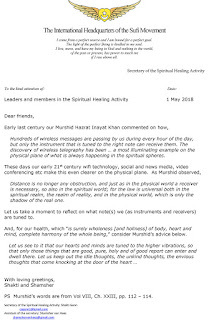 Murshid, Hazrat Inayat Khan explains below the reason for focusing our minds on what we desire in healing, and how this rule relates to life generally. If the healer should happen to hold the picture of a wound, he would help the wound to continue instead of being healed; and so if he thought of pain it might perhaps be continued more intensely by the help of his thought. It is the cure that he should hold in mind. It is the desired thing that he must think about, not the condition. In all aspects of life this rule must be remembered; that even in trouble one must not think of the trouble and in illness one must forget about illness. Man often continues life's miseries by giving thought to them. The healer must from beginning to end hold the thought of cure and of nothing else. 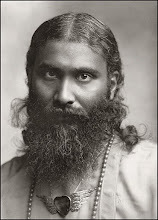 In relation to keeping the names of persons on the healing list and information we have about their symptoms confidential, Hazrat Inayat Khan tells us:One must consider that everything that is entrusted to one by any person in life is one’s trust, and one must know that to prove true to the confidence of any person in the world is one’s sacred obligation. 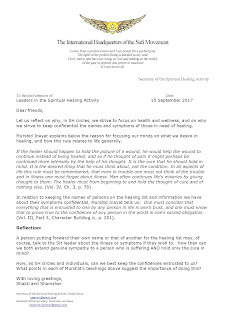 A person putting forward their own name or that of another for the healing list may, of course, talk to the spiritual healing leader about the illness or symptoms if they wish to. How then can we both extend genuine sympathy to a person who is suffering and hold only the cure in mind? How, as spiritual healing circles and individuals, can we best keep the confidences entrusted to us? What points in each of Murshid’s teachings above suggest the importance of doing this? 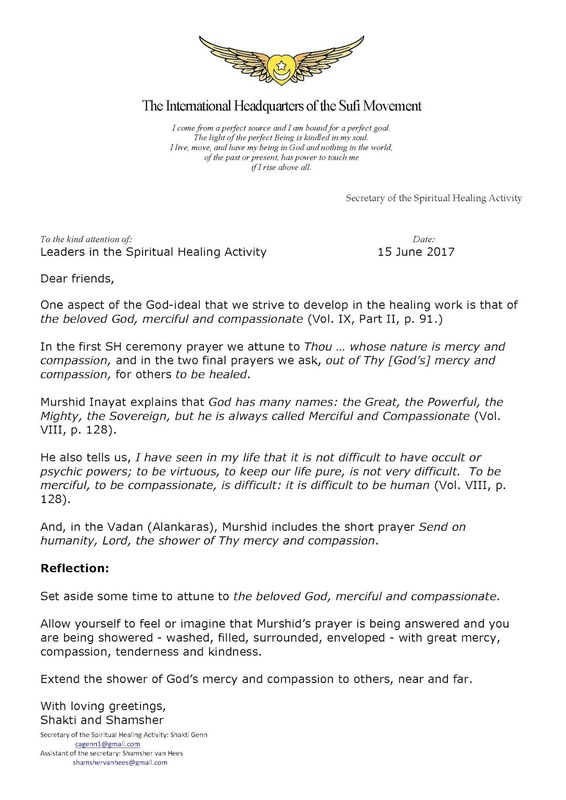 One aspect of the God-ideal that we strive to develop in the healing work is that of the beloved God, merciful and compassionate. 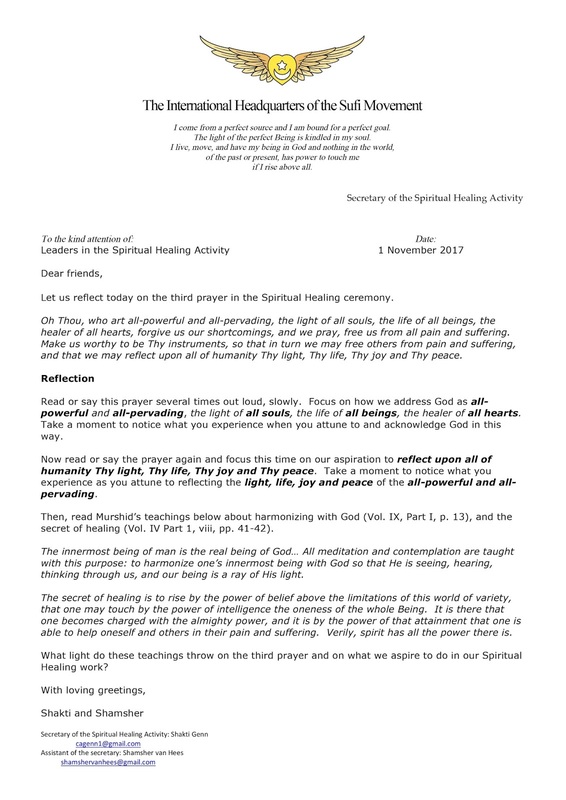 In the first Spiritual Healing ceremony prayer we attune to Thou … whose nature is mercy and compassion, and in the two final prayers we ask, out of Thy [God’s] mercy and compassion, for others to be healed. 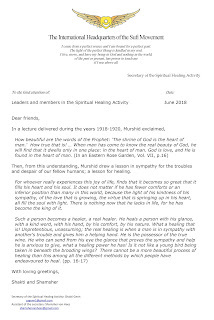 Murshid Inayat explains that God has many names: the Great, the Powerful, the Mighty, the Sovereign, but he is always called Merciful and Compassionate. He also tells us, "I have seen in my life that it is not difficult to have occult or psychic powers; to be virtuous, to keep our life pure, is not very difficult. To be merciful, to be compassionate, is difficult: it is difficult to be human." And, in the Vadan (Alankaras), Murshid includes the short prayer, "Send on humanity, Lord, the shower of Thy mercy and compassion." Set aside some time to attune to the beloved God, merciful and compassionate. Allow yourself to feel or imagine that Murshid’s prayer is being answered and you are being showered - washed, filled, surrounded, enveloped - with great mercy, compassion, tenderness and kindness. Extend the shower of God’s mercy and compassion to others, near and far.